I recently saw this years Frozen Summer Fun Parade. The parade was nice considering it supposedly had small budget and was an improvement over last years version. It provides that good mid day distraction that parks benefit from. Hollywood Studios has had lots of parades since it’s opening but in recent years they stopped doing them; having one back in the park was nice. Unfortunately, this parade really does just accentuate the Frozen overload that has been part of Hollywood Studios. Since the parade stops to sing “Let it Go” twice you can end up hearing it around 5 times during a single visit to the park. Twice during the parade, twice during the sing a long and once more during the nighttime fireworks. And since it’s not background music it can really start to grate on you as the hot humid day wears on. Now everyone can know what those stay at home parents or child care professionals had to listen to all day after it came out. While I thought it was decent for a low budget parade, I couldn’t help but think that there was a missed opportunity. This missed bit of story telling would be on Olaf’s float. At the end of the movie Elsa created a snow cloud for Olaf so he wouldn’t melt, Disney should of included that cloud on the float. During one of the stage shows they make reference to him melting in the heat, so the inclusion of the cloud would of been nice continuity. 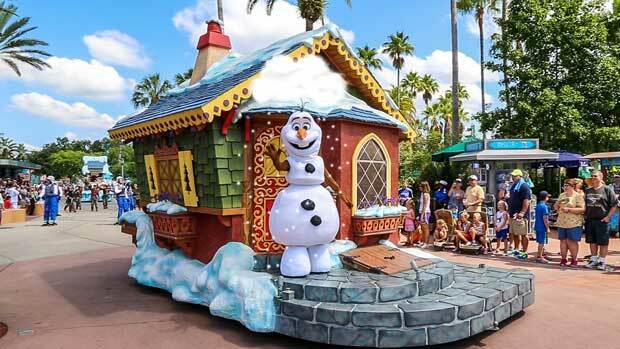 This would also provide a explanation for why Olaf couldn’t leave his float during the “Let It Go” portions of the parade. I understand the reason why they didn’t do something like this. On being that they didn’t do these sort of small touches is because the parade was merely a stop gap. Something to keep the guest entertained during peak season but without much cost. Another was that, with the exception of Elsa’s float the rest are from the Christmas Parade at Magic Kingdom. Since they are used for something else they were probably hesitant to make alterations to the floats. I don’t think the support structure would really of caused much of a lasting issue to the float. The support and mechanism to create the suds for the snow would be inside the float, a hatch door cut into the alcove roof of the building would lead to the cloud which would contain the blower mechanism.